HOUSTON (ICIS)--US February contract prices for styrene butadiene rubber (SBR) were assessed 3.5 cents/lb ($77/tonne) higher on Wednesday. The increase comes on the back of a 4.75 cent/lb increase – on a direct average basis – for same-month butadiene (BD). 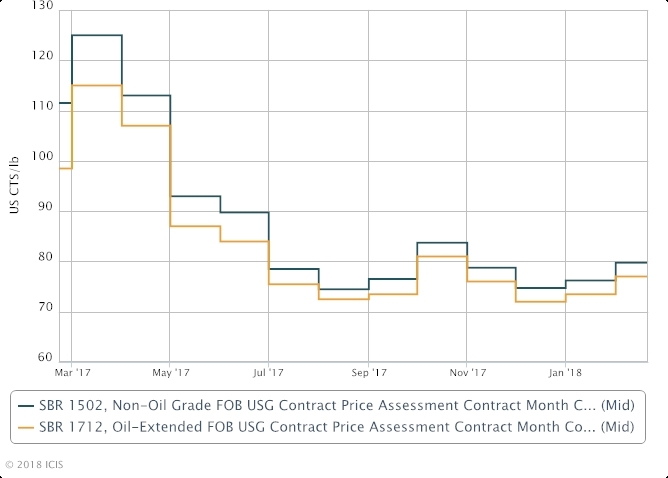 SBR contracts in the US typically take around 70-75% of the same-month BD movement, with allowances for feedstock styrene as needed. The movement puts 1502 non-oil grade SBR at 76.25-83.25 cents/lb, and 1712 oil-extended grade SBR at 72.50-81.50 cents/lb. Market sources said the increases are not expected to curb demand, although demand growth remains somewhat stagnant. Additionally, although import prices are described as being at a discount to domestic prices, sources said there is little interest in import SBR. This is likely attributed to the steady demand and available contract volumes to most US SBR buyers, sources said. Major North American producers of SBR include Dynasol, Goodyear Tyre and Rubber and Lion Elastomers.